Got a couple months now with no shows. I consider this type of stretch a hiatus, and I make a long list of things to work on. Things get done and crossed of the list (I’m a scribbler), then more stuff gets added on, it’s always a work in progress, and it ends up looking like this. 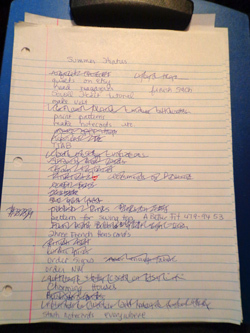 One of the things on my list was to publish Spice Pinks. I wrote about this project back in April, when the May/June issue of Quiltmaker came out. 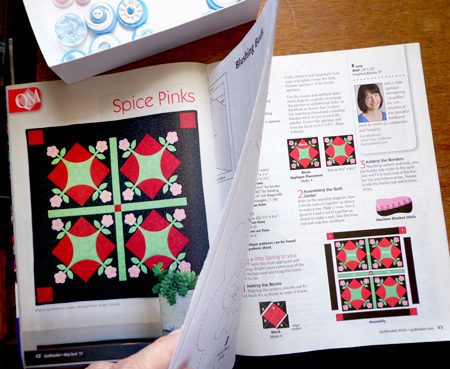 Spice Pinks is an old block that I first saw 25 years ago when I signed up for my Beginning Quilting class. It was included in the sampler we were going to make, and I was captivated. When I started the class, I was slightly disappointed to find out that another block had been substituted. But I never forgot Spice Pinks, and here’s my version of it! A little appliqué reimagining eliminates curved piecing, and a non-traditional palette gives it a modern zing. Of course you can make it with any colors you like! If you missed it in the magazine, the pattern is now available on my website, on the Patterns page. More stuff to come from The List! Just to look at them. What a fun project!